PADI (Professional Association of Diving Instructors) is the worlds’ largest diver training agency and the Open Water Diver Course is the most popular and recognized diving certification which is accepted at over 5,900 dive centers worldwide. We offer a range of PADI diving courses to suit each person level from trial dives to the professional Divemaster and can cater for all ages from 10 years and above. Teaching is a passion and we realize that well trained divers, new divers are safe and have fun and less or no impact to the fragile ecosystem. We are waiting you to learn scuba diving and we work to offer the best possible diving course without question on service. 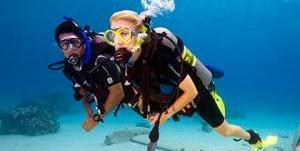 Under the guidance of experienced diving instructor we teach all PADI courses as an entry level. For beginners who just want to try scuba diving we have the PADI Discover Scuba Diving the way to learn how to dive as a 1 day diving trip. If you would like to become a certified diver you can enroll for PADI Scuba Diver Course designed to be taught in 2 days or for PADI Open Water Course in 4 days. When you are certified as Open Water Diver If you want to get more experience enroll for PADI Advanced Open Water Course and go diving on the best dive site we propose you. The goal of this course is to build confidence and gain more experience in new diving areas. Have you ever wondered what it’s like to breathe underwater? If you want to find out but aren’t quite ready to take the plunge into a certification course, Discover Scuba Diving will let you try scuba to see if you like it. You might try it while you’re on vacation. Short on time and long on the urge to become a certified diver? The PADI Scuba Diver certification might just be for you. This course requires less time than the PADI Open Water Diver Course, covering only the first three of five sections of knowledge development, the first three of five pool sessions, and the first two of four open water training dives, resulting in a limited certification. Particularly if you expect to go scuba diving primarily in the company of a dive guide or if you have limited time to devote to scuba certification, consider becoming a PADI Scuba Diver. This certification allows for ample dive experience and is a good warm-up for the PADI Open Water Diver Course, if that’s your ultimate goal. PADI Scuba Divers are qualified to dive under the direct supervision of a PADI Divemaster, Assistant Instructor or Instructor to a maximum depth of 12 meters / 40 feet, to obtain air fills, rent or purchase scuba equipment and participate in other diving activities as long as they have the required supervision and to continue their dive training and complete PADI Open Water Diver certification and other courses such as Project AWARE and Equipment specialty courses. Minimum Age: 15 years (10 years for Jr. Scuba Diver). Group instruction: 13,000 THB / person. Get your PADI scuba certification. If you’ve always wanted to learn how to scuba dive, discover new adventures or simply see the wondrous world beneath the waves, this is where it starts. The PADI Open Water Diver course is the world’s most popular scuba course, and has introduced millions of people to the adventurous diving lifestyle. PADI Open Water Diver are qualified to dive to a maximum recommended depth of 18 meters / 60 feet in accordance with the PADI standards, to obtain air fills, rent or purchase scuba equipment and participate in other diving activities as long as they have the required supervision and to continue their dive training and complete PADI Advanced Open Water Diver certification and other courses such as few specialty courses. Minimum Duration: 3 days.Option eLearning: You don’t have to wait to get going. With PADI eLearning and the PADI Open Water Diver Course, you can start right now. The PADI Open Water Diver Course Online lets you learn the background information you need before each dive at your own pace through friendly, interactive learning. It even helps you choose the PADI dive shop where you’ll make those dives. Enroll in the PADI Open Water Diver Course online for immediate computer-based access to the manual and video integrated into seamless, guided online learning. PADI eLearning requires an extra registration step for students less than 13 years due to international internet laws. To purchase this course contact us. Exploration, Excitement, Experiences. They’re what the PADI Advanced Open Water Diver course is all about. And no, you don’t have to be “advanced” to take it – it’s designed so you can go straight into it after the PADI Open Water Diver Course. The Advanced Open Water Diver course helps you increase your confidence and build your scuba skills so you can become more comfortable in the water. This is a great way to get more dives under your belt while continuing to learn under the supervision of your PADI Instructor. This course builds on what you’ve learned and develops new capabilities by introducing you to new activities and new ways to have fun scuba diving. 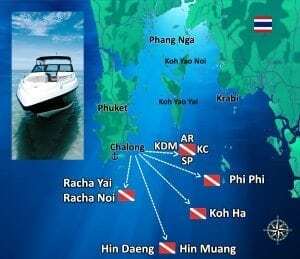 You’ll hone your skills by completing five adventure dives that introduce you to Underwater navigation and Deep water Diving (typically anywhere from 18-30 meters/ 60-100 feet) and a sampler of three more Adventure Dives of your choice (i.e. wreck dive, drift dive, underwater photographer, underwater naturalist, etc.). Option eLearning: The PADI Advanced Open Water Diver Online gets you started right now with the background information you need for the seven of the most popular Adventure Dives (though you and your instructor can still choose any of the Adventure Dives). To purchase this course contact us. 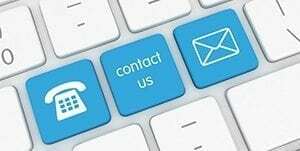 Emergency First Response courses encompass, CPR Course for adults, children and infants, first aid for adults, children and infants and Automated External Defibrillator training (on request). Fare: 7,500 THB (No dives). Option eLearning: The PADI Rescue Diver course is the newest addition to the PADI eLearning family. Rescue Diver Online gets you started right away and let you learn at your own pace and in your own time. To purchase this course contact us. 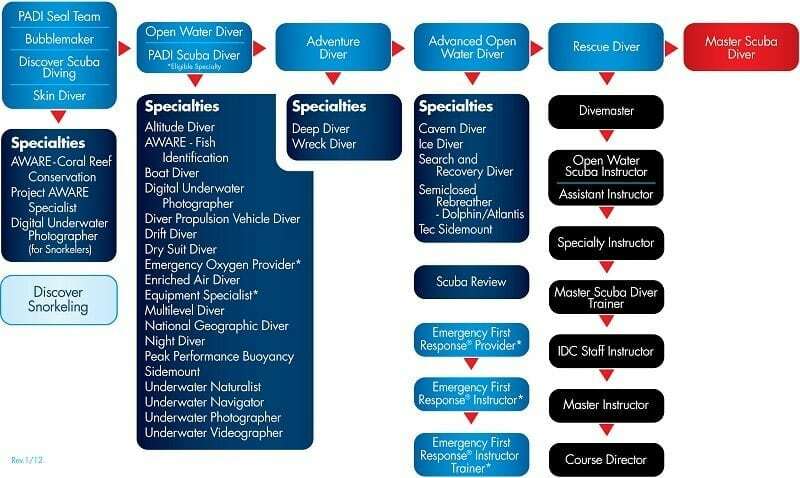 Have a look the flow chart above to choose the specialty course available you would like to get it. Why not become an Enriched Air (Nitrox) Diver : The PADI Enriched Air Diver course is PADI’s most popular specialty scuba diving course, and it’s easy to see why. Scuba diving with enriched air nitrox gives you more no decompression dive time. This means more time underwater, especially on repetitive scuba dives. To purchase this course contact us. Minimum Duration: 1 day + theory. Have the PADI Open Water Diver certification (or have a qualifying certification from another organization such as CMAS, NAUI, SSI, FFESSM, etc.). For further information about this diving courses, please contact us. 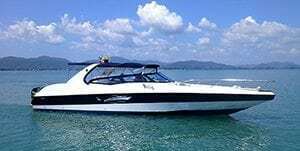 All transfers within 15 km from Chalong (Patong, Karon, Kata, Chalong, Rawai and Nai Harn). 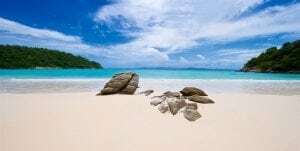 In addition we offer transfers adapted according to your places of residence on the island. Lunch & soft drinks on boat.